According to the Consumer Product Safety Commission, every year, there are more than 7,500 backpack-related injuries reported across the United States. According to the Consumer Product Safety Commission, every year, there are more than 7,500 backpack-related injuries reported across the United States. These backpack injuries include everything from bruises and sprains, to back and shoulder fractures. 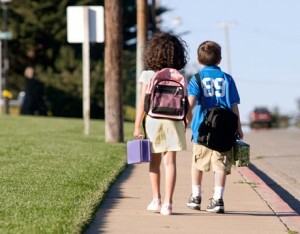 Backpacks pose a major and serious back injury risk to children. This is in spite of the fact that the American Academy of Pediatrics has set specific guidelines for the weight of children’s backpacks in order to reduce the risk of injuries. For instance, the American Academy of Pediatrics guidelines state that a backpack should weigh no more than 10 % to 20% of the child’s body weight. There may be slight variations however, considering the child’s weight and physical fitness levels. In order to reduce the risk of backpack-related back injuries involving a child, carry only limited items in your backpack. Items must be limited to the items that will be necessary for that day. Distribute the weight of the items in the backpack evenly. Wear both the straps of the backpack. Wearing just one strap can shift the weight to just one part of the body. This can cause muscle spasms, and result in lower back pain later. Choose a backpack that is ergonomically designed, as this is not just comfortable, but also safer for the child to wear. Your backpack should come with a padded back, which is not only more comfortable but also results in lower pressure on the shoulder, back and underarms. Hip and chest belts can shift some of the weight to the hips and torso. Choose a backpack that comes with multiple compartments that can make things not just convenient to store, but also distributes the weight evenly. While wearing a backpack, make sure that it fits evenly on the middle of your back. Adjust the straps of the backpack to make it easy for the child to remove and wear the backpack without any difficulty.